Your sails work hard all summer…….Why not give them a break this winter? 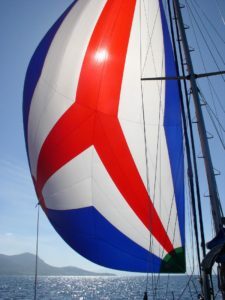 After a hard season, most sails will benefit from a thorough inspection and valeting; don’t leave them on board or in your garage over the winter as they will only deteriorate further. Store your sails, for free, in a controlled environment. Return your sails in time for next season. As you can see, not only can we solve your sail and valeting problems this winter but, subject to sail condition, we will even guarantee them for 12 months. All of this at a reasonable price to give you an enjoyable season. Jeckells is run by forward-thinking individuals who, together with dedicated staff, enable the company to constantly improve customer service. We operate out of our purpose-built sail loft in Norfolk which means we are very competitive on price. We now have an office on the South Coast too. Jeckells have been at the forefront of many currently accepted ‘standard practices’. Jeckells were the first to offer sail valeting…… all done by a man in a bath with two planks of wood strapped to his feet!!!!!!!! How things have changed! They are now washed by machine, can have UV protection added, cloth stiffening agents added and, if requested, can be treated against mildew. We still put the same amount of care and skill into every sail we repair, valet or manufacture as did my forbears nearly two hundred years ago. I hope you will allow us to pass on some of this knowledge, skill and experience to you! I look forward to hearing from you.